Beat the heat during your weekend grilling sessions in a novel way—with soup; a cold soup. Perfect as a first course at any meal, a cold soup is great for a backyard barbecue. Although always popular in Eastern Europe, cold soups didn’t make their mark in North America until 1917, when Ritz hotel chef Louis Diat invented Vichyssoise, named for a French resort, consisting of potatoes and leeks. Now other cold soups are popular, like Gazpacho, and especially fruit soups. That’s great, but we just want a no-nonsense, tasty, refreshing, cold fruit soup to compliment our cookout. So here’s a creamy berry soup sure to please your guests and yourself as well, as it is so easy to prepare. Let’s make some and put it in the refrigerator. Put the fruit, sugar and juice in an electric blender. 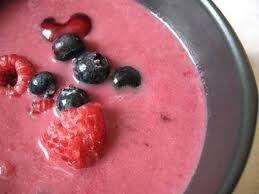 If you are using frozen fruit you may want to heat it slightly so the sugar dissolves properly. Cover and blend until well mixed. Remove to suitable bowl and stir in the sour cream. Cover the bowl and chill for 30-60 minutes. Put it out with a nice ladle and bowls (single- use are welcome), maybe garnish with some berries or a teaspoon of sour cream if you please. woweee...this is indeed delicious...i can feel the cool seeping in! thank you! This must be very good. looks so yummy!! loved the color..
Looks fantastic ~ I could devour it all in no time :)) The color you got is beautiful! What a gorgeous color! I think we really do eat with our eyes first. The soup sounds so easy and refreshing I look forward to trying it. Thanks also for your comments about my short ribs. If you are ever in South Florida let me know, Steve and I will have you over for dinner.